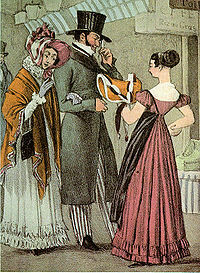 the 1820s, this neoclassical aesthetic was decisively repudiated, preparing the way for the main fashion features of the next ten to fifteen years (large sleeves, somewhat strict corseting of the natural waist, full skirts, elaborate large-circumference hats, and visual emphasis on wide sloping shoulders). Rich colors such as chrome yellow and Turkey red became popular, and fabrics with large bold checkerboard or plaid patterns became fashionable, (another contrast with the previous fashion period, which had favored small delicate pastel prints). A bustle was sometimes also worn. Belts accentuated the new defined waist. Dresses were often worn with a round ruffled linen collar similar to a soft Elizabethan ruff. Hairstyles and headgear Early in the decade, hair was parted in the center front and styled into tight curls over the temples. As the decade progressed, these curls became more elaborate and expansive. The bun on the back became a looped knot worn high on top of the head. Wide-brimmed hats and hat-like bonnets with masses of feathers and ribbon trims were worn by mid-decade. Conservative married or older women wore indoor caps of fine linen descended from the earlier mob cap; these had a pleated or gathered caul on the back to cover the hair, and a narrow brim at the front that widened to cover the ears and often tied under the chin. These caps were worn under bonnets for street-wear.